Philip P. Walsh is the author of Gas Turbine Performance, 2nd Edition, published by Wiley. 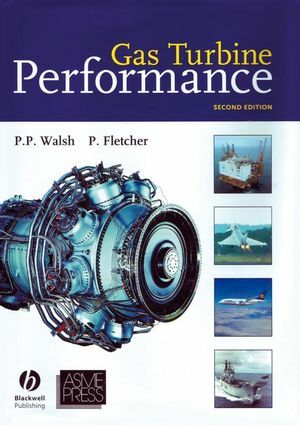 Paul Fletcher is the author of Gas Turbine Performance, 2nd Edition, published by Wiley. 1 Gas Turbine Engine Applications. 1.1 Comparison of gas turbine and high speed diesel engines. 1.3 Industrial mechanical drive applications. 1.6 Aircraft applications - propulsion requirements. 1.7 Shaft powered aircraft - turboprops and turboshafts. 1.8 Thrust propelled aircraft - turbofans, turbojets and ramjets. 1.9 Auxiliary power units (APUs). 3 Properties and Charts for Dry Air, Combustion Products and other Working Fluids. 3.1 Description of fundamental gas properties. 3.2 Description of key thermodynamic parameters. 3.3 Composition of dry air an combustion products. 3.4 The use of CP and gamma, or specific enthalpy and entropy, in calculations. 3.5 Data base for fundamental and thermodynamic gas properties. 3.6 Charts showing interrelationships of key thermodynamic parameters. 4 Dimensionless, Quasidimensionless, Referred and Scaling Parameter Group. 4.1 The importance of parameter groups. 4.2 Tables of parameter groups and description. 4.4 Second-order effects - steady state performance. 4.5 Second-order effects - engines scaling. 4.6 Second-order effects - transient performance. 4.7 Why components and engines adhere to the parameter group relationships. 5 Gas Turbine Engine Components. 5.1 Axial compressors - design point performance and basic sizing. 5.2 Axial flow - off design performance. 5.3 Centrifugal compressors - design point performance and basic sizing. 5.4 Centrifugal compressors - off design performance. 5.5 Fans - design point performance and basic sizing. 5.6 Fans - off design performance. 5.7 Combustors - design point performance and basic sizing. 5.8 Combustors - off design performance. 5.9 Axial flow turbines - design point performance and basic sizing guidelines. 5.10 Axial flow turbines - off design performance. 5.11 Radial turbines - design. 5.12 Radial turbines - off design performance. 5.14 Ducts - off design performance. 5.15 Air systems, turbines NGV and blade cooling - design point performance. 5.16 Air systems - off design performance. 5.17 Mechanical losses - design point performance and basic sizing. 5.18 Mechanical losses - off design performance. 5.19 Mixers - design point performance and basic sizing. 5.20 Mixers - off design performance. 5.21 Afterburners - design point performance and basic sizing. 5.22 Afterburners - off design performance. 5.23 Heat exchangers - design point performance and basic sizing. 5.24 Heat exchangers - off design performance. 5.25 Alternators - design point performance. 5.26 Alternators - off design performance. 6 Design Point Performance and Engine Concept Design. 6.1 Design point and off design performance calculations. 6.2 Design point performance parameters. 6.3 Design point calculation and diagram. 6.4 Linearly scaling components and engines. 6.5 Design point exchange rates. 6.6 Ground rules for generic design point diagrams. 6.7 Open shaft power cycles: generic design point diagrams and exchange rates. 6.8 Combined heat and power: generic design point diagrams and exchange rates. 6.9 Closed cycles: generic design point diagrams and exchange rates. 6.10 Aircraft engines shaft power cycles: generic design point diagrams and exchange rates. 6.11 Aircraft engine thrust cycles: generic design point diagrams and exchange rates. 6.12 The engine concept design process. 6.13 Margins required when specifying target performance levels. 7.1 Generic off design characteristics. 7.2 Off design performance modelling - methodology. 7.3 Off design performance modelling - flow diagrams and sample calculations. 7.4 Geometric variation: modelling and effects. 7.5 Engine scaling and different working fluids. 7.6 Off design matching: physical mechanisms. 8.1 The fundamental transient mechanism. 8.3 Engine accel and decel requirements. 8.6 Surge, rotating stall and locked stall - the events and their detection. 8.7 Surge margin requirements and the surge margin stack up. 8.8 Parameter groups and transient performance. 8.9 Scaling parameter groups and transient performance. 8.10 Control strategies during transient manoeuvres. 8.11 Transient performance and control models. 9.1 The fundamental starting process. 9.2 Start processes for major engine types and applications. 9.4 The impact of ambient temperature and pressure. 9.6 Starting and parameter groups. 9.7 Control Strategies and parameter groups. 9.8 Starter system variants and selection. 9.9 Start and control models. 10.6 The effect of ambient conditions. 11.1 Types of engine test bed. 11.4 Steady state development testing. 12 The Effects of Water - Liquid, Stream and Ice. 12.6 Rain and ice ingestion. 12.7 The thermodynamics of water. 12.8 Gas turbine performance modelling and test data analysis. 13 Fuel and Oil Properties and their Impact. 13.1 The combustion process and gas turbine fuel types. 13.2 Data base of key fuel properties for performance calculations. 13.3 Synthesis exchange rates for primary fuel types. 13.4 Oil types and data base of key properties. 14 Performance of In-service Products. 15 Performance and the Economics of Gas Turbine Engines. Appendix A: Station Numbering and Nomenclature. A.1 International station numbering and nomenclature standards. A.2 ARP 755A station numbering. See errata in the Excel file.